Planning is well underway. The website is updated. Information re Call for Abstracts is posted detailing the conference streams and specific topic areas for presenters. Deadline for abstract submissions is February 28, 2018. 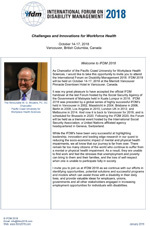 View the “Welcome to IFDM 2018” message from the Honourable Wayne G. Wouters, PC, OC, Chancellor of PCU-WHS, host organization for the event, by clicking on the “More information” link provided below. Hotel and venue information is available on the website, as well as information regarding discounted travel fares.